When a TV series is in its 5th year, you are guaranteed some quality viewing. Of course, this is also the time when series sometimes become a little repetitive and may lose some of its viewership. The fifth season of Homicide borders on this concept, however it's writers have actually done something interesting with their characters, more particularly with character Frank Pembleton (Andre Braugher) who is the main focus of this season and how his return to work after a stroke is anything from easy. Not only must he prove himself to his colleagues, including his partner Tim Bayliss (Kyle Secor) but also himself who was the ace detective of the series. The other storyline that flows through the series is that of Detective Mike Kellerman (Reed Diamond) who is facing corruption charges and as more evidence is uncovered, his future seems very uncertain. With series 5, we also see some new faces join the cast that include Detective Paul Falsone (Jon Seda), Terri Stivers (Toni Lewish) and Chief Medical Examiner Julaina Cox (Michelle Forbes) who do add some new life into this series. With that said, can the series be watched by a newcomer? The answer is yes and no. As most stories are standalone, there are common themes that flow through the episodes and a history on the characters and cases are sometimes needed to put the pieces together. Given that, this release is definitely for the fans. Featuring all 22 episodes of series 5, Homicide is a very well made TV series that is definitely American drama at its best. The series begins with a bang with a two-parter called "Hostage" that is another great insight into Detective Frank Pembleton as he decides to stop taking his medication in order to help solve a case. It's these small moments that have such a powerful impact of the stories. From murders to drug lords, prisons and more human inspired storylines such as relationship breakdowns, secrets and finding your place in the world, Homicide boasts some amazing writing in this series. Of course, the excellent acting by all involved almost makes Homicide feel like a TV reality police series because everything is so real and is almost a snapshot of the real-world that we live in. However with that said, a few of the episodes are a little bit of a hit and miss affair but fortunately, this is a rare occurrence. The visuals of Homicide are amazing and give quite a gritty appearance to the series. The video quality looks great, even on a FULL HD TV with sharp image and deep blacks. There was some artifacting here and there but overall, it is a very good looking US series. Add in a decent audio soundtrack, powerful musical scores and this truly enhances the overall Homicide experience. 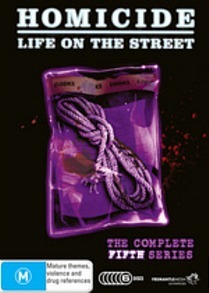 In the end, this is as good as American TV can get and if you have never seen Homicide: Life on the Street, I would strongly suggest you check out series 1 - 4. Recommended!